I'm not one of those people that takes pleasure from cleaning. Chores for me, are just that, a chore. The quicker and I can get them done, the better, and I've been known to make serious investments to make that happen, because really, what you're paying for, is time. Last year, for Christmas (I kid you not), I asked for a Dyson, this cordless one, and frankly, it changed my life. If you follow me on social media you'll know all about my love for the steam iron too (double the ironing in half the time). So when Tom came home from work telling me that the lunchtime chat was in praise of the steam mop (I think they all need to watch a bit more telly) I was all ears. Since the baby started her weaning adventures, I felt like I was rarely without a mop in hand. If I don't keep the floor clean, a white baby grow has a special knack of naming and shaming. Before we move on, I should just point out all pictures featuring G were taken with the mop unplugged, it's definitely not a toy. A.O.com had lots of choice, hands up who thought they only did the big white goods? *puts both hands in the air*, turns out they sell everything. The Thane H20 X 5 is the mid price option £69 down from £120 in the Black Friday sale (yes, already! 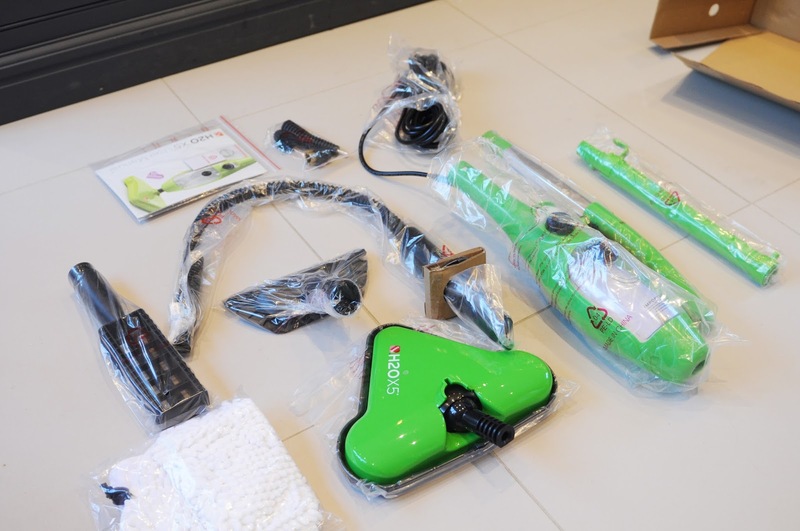 ), it comes in a bright green, claims fifteen minutes run time on a single tank and even offers window and carpet cleaning. For me, it needs to to a good job on the tiles to get a pass. Standard delivery is free from AO, although there are other options available. They use DPD which I find the best of the bunch. I have downloaded the app which means that I can track the driver to see how far away my parcel is. I've even taken a photo of my 'safe place'. It arrived in a small box, which I wasted no time in emptying, and my brother wasted no time in filling back up with a baby. At least it gives you a sense of scale. It was well packaged within a cardboard insert and all of the small parts were bagged together. It took me five minutes to put together after a quick flick through the instructions. I wanted it in floor cleaning mode so I added the mop head, extension part, the handle and the washable mop head cloth. The cord is generous and can be looped around the handle to stay tidy. The head folds downwards meaning that it can be hung on the back of the door or tidied into a cupboard while not in use. Does it work? Like a blooming dream. I honestly didn't know how filthy those tiles were until I started my steamy adventures. I strapped the baby into her high chair in front of the telly, with a line-up of raisins to keep her busy and got stuck in. I filled the tank to the max and selected 1 for low level steam. The mop was really easy to use, it glided well over the surface and I didn't have to apply pressure to see results, the steam did all of the work. The head swivels on a ball fitting so it's easy to get into corners and under tables. After I'd done a small area with the mop head, it started really showing the grout up, so I changed tack. A very speedy removal of the handle and the head, popped on the jet nozzle and brass brush and in minutes I had a hand-held steamer. I cranked it up to medium steam power and worked up and down the grout easily and just like that, they were back to their former glory. I couldn't believe how effective it was at bringing the tiles and grout back to life. I even called Tom in to witness the miracle at work! The jet steam is powerful and controlled, it does leave a slight puddle in 'jet' mode because of the concentrated use in one area (in my case a muddy coloured one from the dirty grout) but I wiped it up easily with some kitchen roll. In mop mode, the floor was only left very slightly damp and dried much more quickly than it would have with a traditional mop. And time is tears for a baby that's been trapped in her high chair for half an hour, so the quicker the better. I really liked the fact that it didn't require detergent, now that G is crawling around the floor it means that the floor is almost immediately baby friendly. It did need topping up every fifteen minutes, this was really easy to do, using the pouring cup provided, the cap came off at the front of the steamer and keeping the steam mop at an angle, it was easily filled back up. I didn't need to wait for the machine to cool (although I disconnected the plug, safety first!). The plug cord is generous and can wrapped around the unit to store it. I hang it on the back of my utility room door when not in use as it's pretty compact. I do need to buy something to store the accessories in too, so that they're handy when I need them. The controls are very basic, a dial for steam output control and a button to switch it on and off. It doesn't need to be any jazzier than that. I've only used it on tiled floor and grout, because that's the only area of the house that's finished (I'm promised we'll have carpet by Christmas) but the steamer also comes with fixtures for window cleaning and clothes steaming, it can even be used on carpets. A quick scan of the online reviews reveals that it's a demon at lifting the pile of carpets. I'll have to keep you posted on that one. Is there anything this gadget can't do? Any downsides? Not many. It only comes with one microfibre cloth and can't be used without it, it can be washed in the machine but I feel that I'll be buying replacements soon enough. They cost £14.99 for three (I found them at The Range) which isn't going to break the bank but it's worth considering. Cleaning the steamer at the end of use was very simple, I emptied the tank then washed the attachments and left them to dry. It's currently hanging on the back of the door, poised for the next baby-led weaning session! 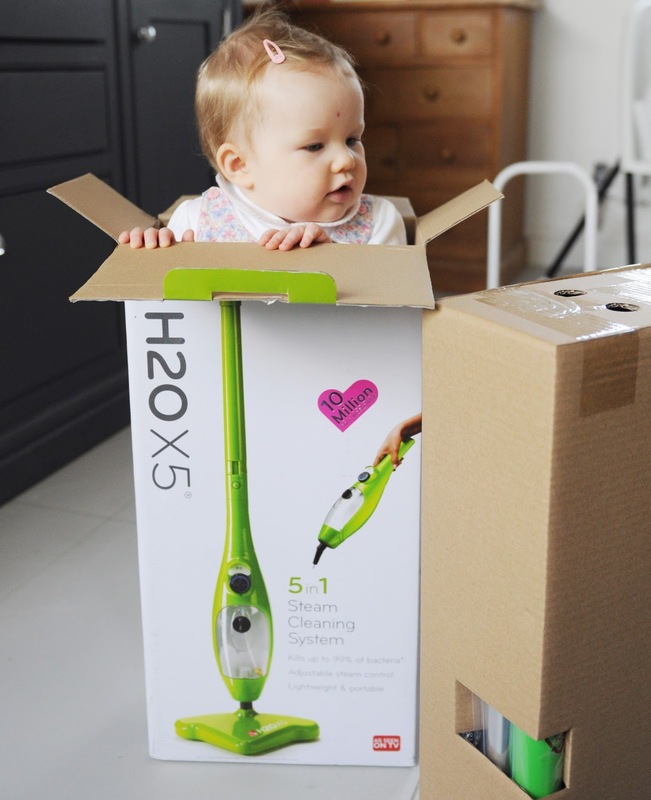 The Thane H20 X5 steam mop is currently on sale from AO.com at £69 down from £106. Click here to find out more at AO.com. 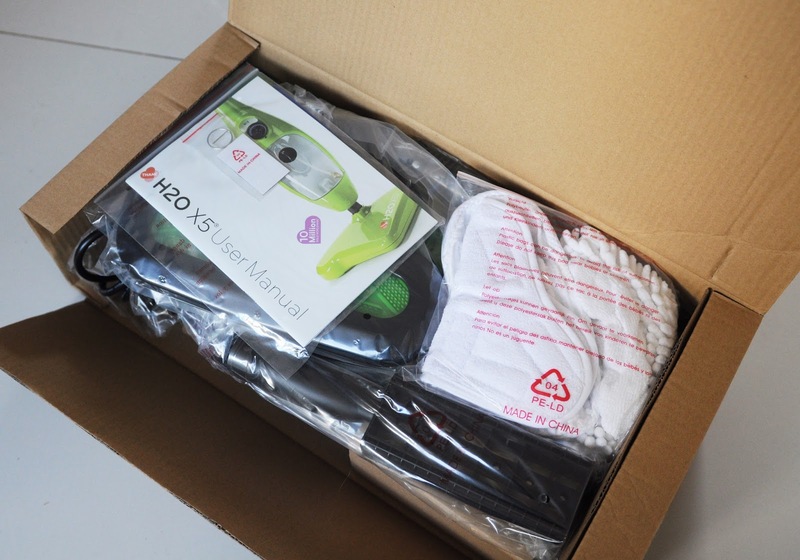 I was sent the mop by AO.com to review . All views are my own.